3/4 x 4 x 5 3/4 in. 1st CAD/CAM object. March 28- 1959 NEW YORKER: Cambridge, Mass.- Feb. 25: "The Air Force announced today that it has a machine that can receive instructions in English- figure out how to make whatever is wanted- and teach other machines how to make it. An Air Force general said it will enable the United States to "build a war machine that nobody would want to tackle." Today it made an ashtray. " APT: Automatically Programmed Tools AIA: Aircraft Industries Association now 'rospace Industries Association MIT: Massachustts Institute of Technology AMC: Air Material Command of the USAF See Wexelblat, R., History of Programming Languages, chapter VI, 1981.. 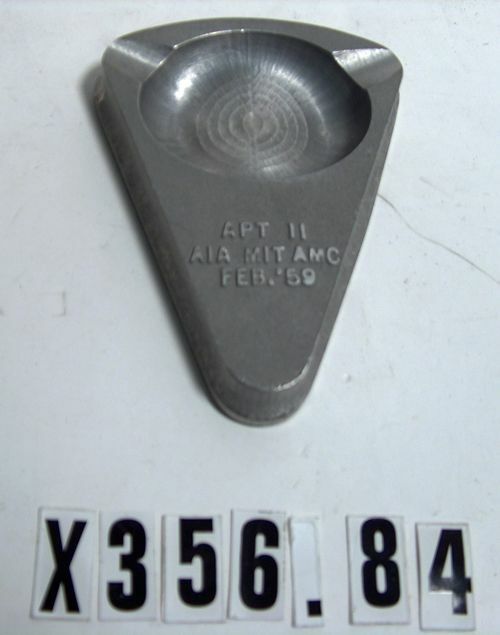 Object is an ashtray in cast aluminum with a cork backing applied to the bottom. 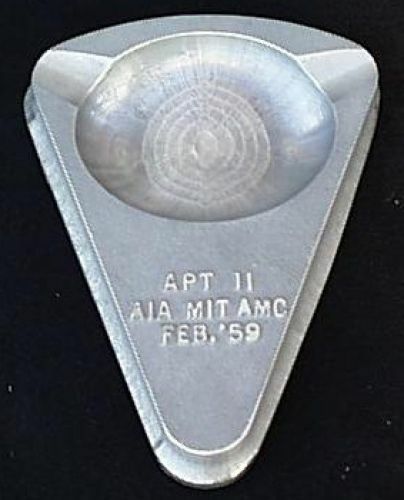 Raised cast letters read "APT II MIT AMC Feb 59"